This entry was posted in News on April 28, 2017 . 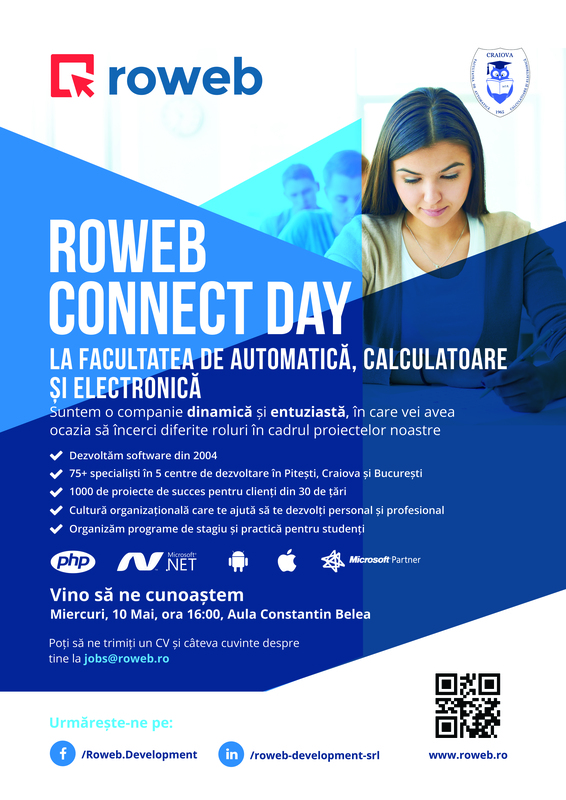 We’re reaching out again to students in Craiova through a meetup at the Faculty of Automatics, Computers and Electronics, on May the 10th, at 4 P.M.
Our colleagues, Senior Web Developers and a Design & UX Expert, will present our company and answer questions about their day-to-day work and their areas of expertise. Through this event, we hope to meet young people as passionate about software as we are, and who might join our growing team at the Craiova office. Starting this year, we’re offering summer internship opportunities in Craiova as well, in addition to the internship program in Pitesti. This way, students in Craiova will get to know us better and apply for the web development internship through our online form. Last year’s event was a great success, as was the Roweb Connect Day held at UPIT, so we expect a great event, with lots of enthusiastic students and interesting questions! See you there!